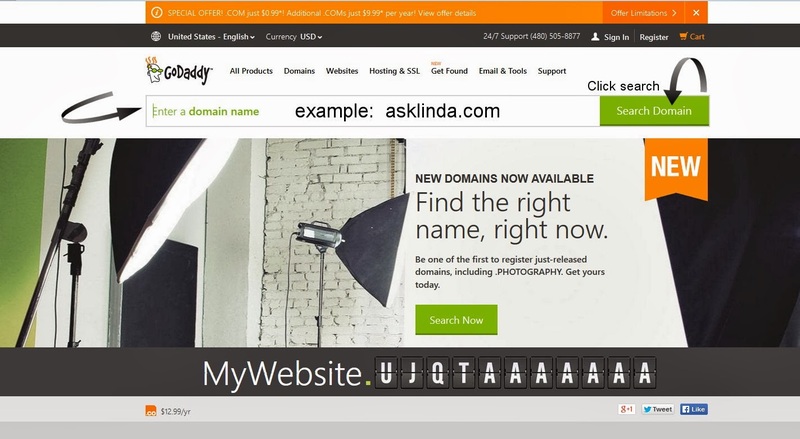 Ok, if you read my previous post, you could see Godaddy has a special for new and transfer for a .com domain name for .99 cents plus 18 cents for ICANN fees. 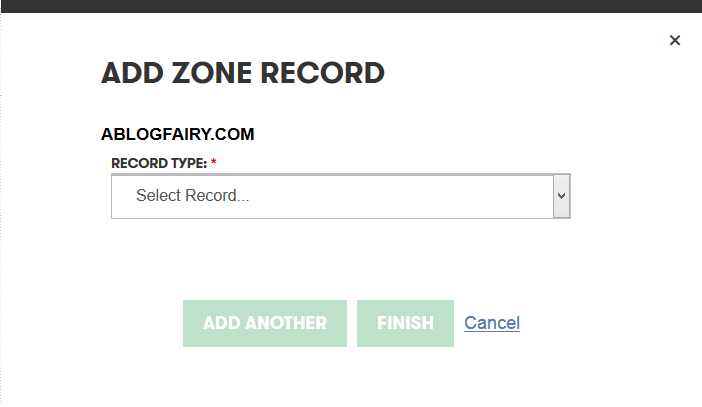 The total for 1 year for your new custom domain is $1.1.7 Check to see if the name you want is available first. Type your chosen name in the big search box. If it is available, then add it to your cart. 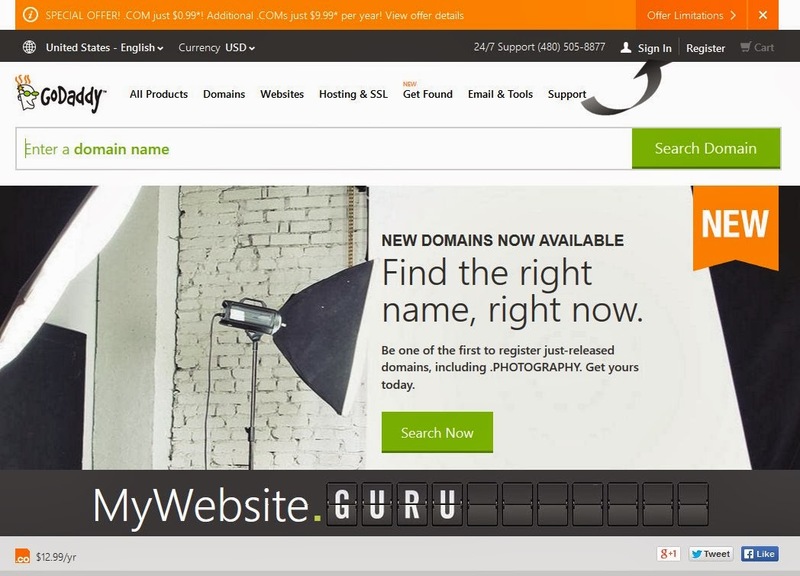 Buy your domain name and create an account with a username and password. You will also create a pin#. They will send an email for you to verify your email address. Make sure you click the email link and save the customer # and password. registered URL to your blog. 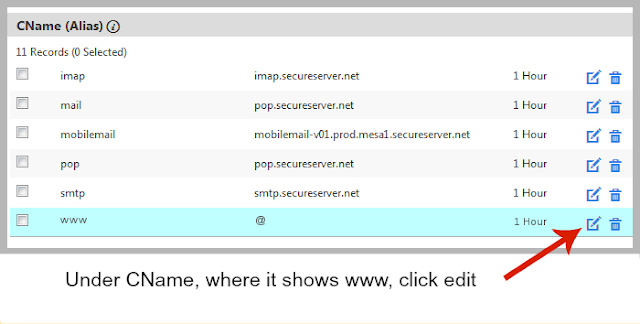 Type in your domain name, with www.blablabla.com, like my example and click save. You will see the codes after Name, label or Host field. Click save and set aside. 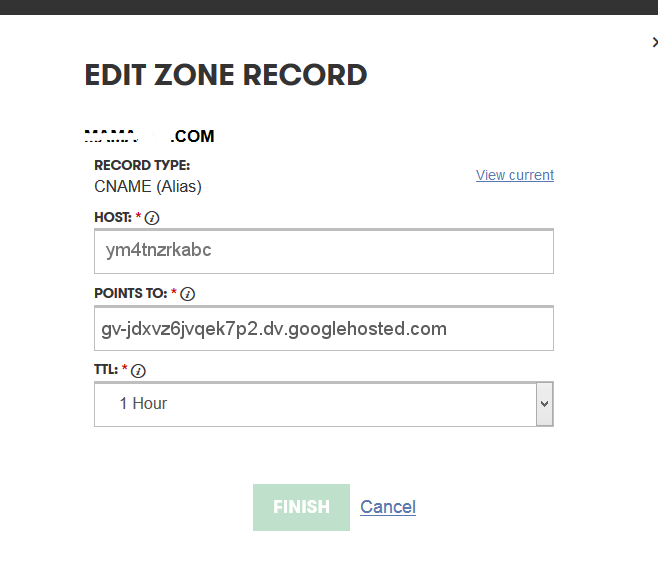 You will need these two codes for the Godaddy DNS settings. Now, sign in your Godaddy into your account. You will see this page, like below. 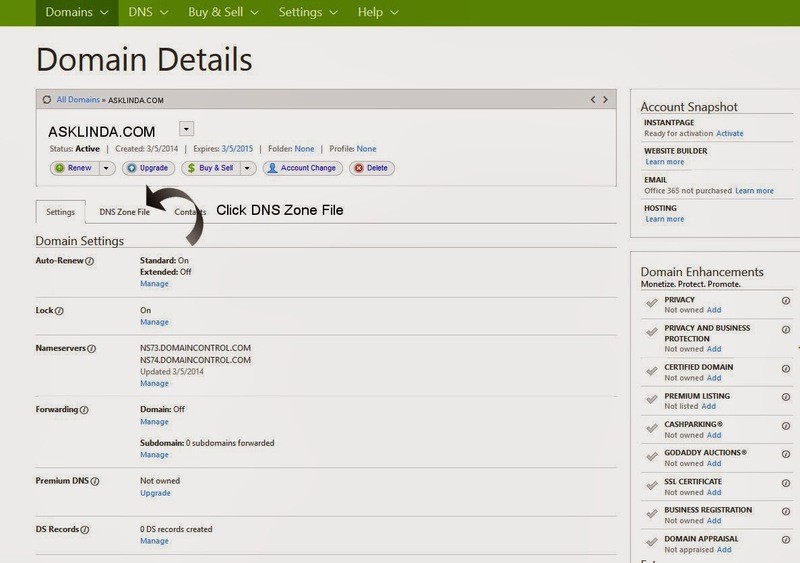 Click Manage across from Domains. This is where you type in those numbers below. You do this 4 times with these numbers. click Finish each time you do this! Delete the orginal host under A records after you have added the 4 numbers. Now, we add the CNAMES in. Don't use these codes, go back to your Blogger and get the codes I talked about earlier. Look for CNAME (Alias) this time. 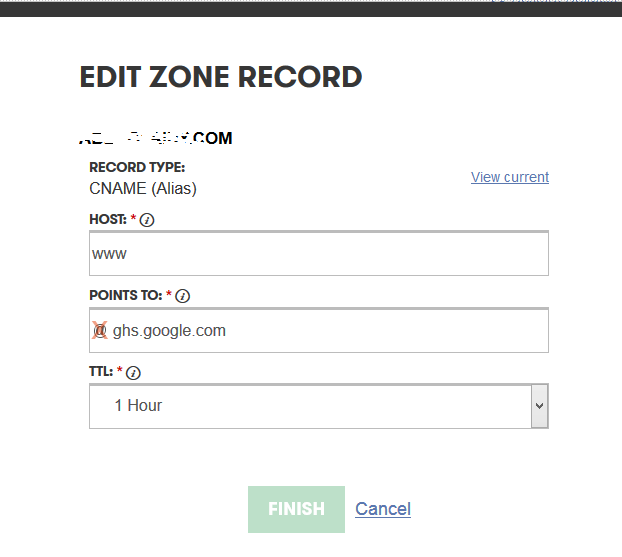 Take the @ out and add ghs.google.com in that place. Now we need to add the long CName you got from Blogger. Don't pay attention to my odd characters, they are just random letter I chose for this demo. It might take up to 24 hours. I have found it usually happens quicky when I have done this for people. This is to prevent any errors from happening when people don't type in www. It's called redirecting the naked domain to www. That's it. 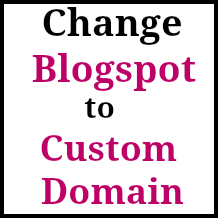 Your blog should re-direct automatically from the old blogspot to your new domain name. It usually happens within minutes or a little longer at certain times. 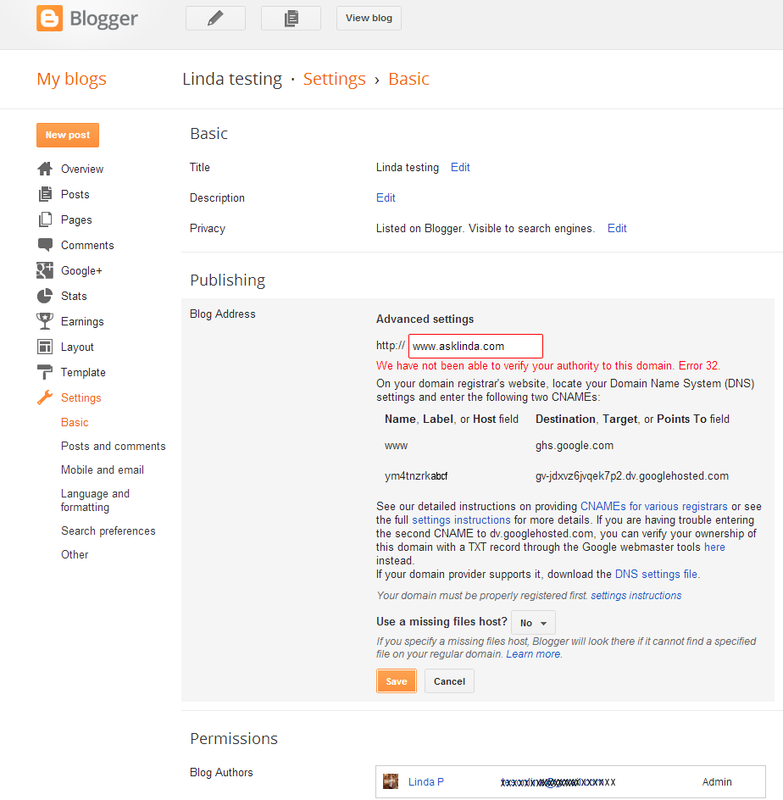 Now, your blog will look more professional. If you can't do this or having problems, I will do it for you for $10.00. Just contact me... or, I have a paypal button on my footer. You will not lose a thing! No need for people to re-follow you again or add you. Easy peasy! Oh, thank you, Linda! I guess you figured after fiddling with me it would be nice to show everybody how to do this! :) I appreciate you so so much and thank you again. What a great deal this is, Linda, and so fabulous that you're helping others in this way. I would not have had a clue on how to do this and your step by step instructions really simplify the process. Hi Linda, So nice to meet you and thank you for this info. 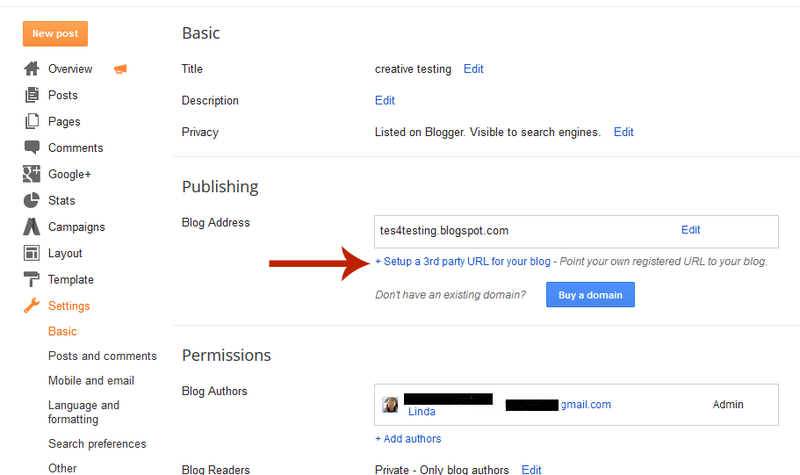 I am trying to do this for my blog, have my domain from godaddy but having trouble getting this on blogger. I am visiting from Sheila's blog post about this. I hope you'll do this for me!!!! Lol!!! Seriously. Hi Linda, thank you so much for sharing all these details so clearly.. I was able to do it without any problem . I am on my own Dot com domain now..